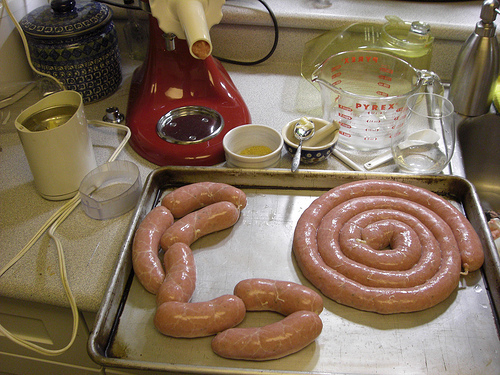 The time has come to try my hand at making sausage from scratch. 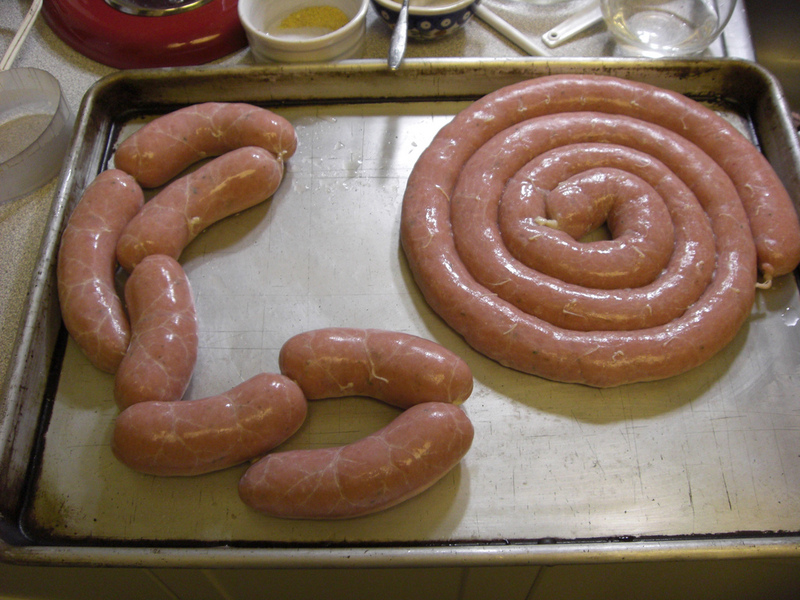 Since this is my first attempt at sausage making I am not making any promises to family or friends about the shape, texture, taste, smell, and overall quality of said sausage. As with most of my first attempts, this will most likely turn out to be less than perfect, but perhaps with some diligence and research I will be able to pull of a masterpiece. So what do I want to make? I know it needs to be German, it can’t be smoked, and must be a fairly simple recipe. After pouring over dozens of recipes I decided I would try the southern German favorite, Weisßwurst (pronounced: vice-vurst). A staple at Oktoberfest, Weißwurst is a mild sausage made with veal and pork and usually served with a sweet mustard and some bread. Step 1: Grind the meat. I put the partially frozen chunks of veal and pork through the fine grinding plate. Step 2: Mix in the herbs and seasonings. Step 3: Emulsify in the food processor. Step 4: Rinse the salt off the hog casings (hog intestines, boo-yeah!) and soak in water. 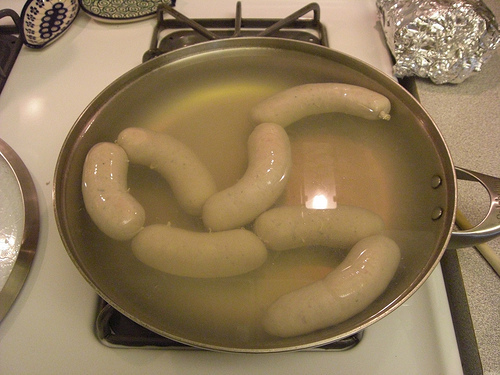 After a bit, rinse the inside of the casings and then soak in water again with a touch of white vinegar. Step 5: Put back through the grinder with the sausage stuffer attachment. Step 6: Load the casings on to the stuffer. Step 7: Get your stuff on. Step 9: Cook in 160F water until internal temp of the meat reaches 150. Step 10: Cool in ice bath. Step 11: Look around the kitchen at the huge mess you just made and wish you had maid service. By the end of the process I was not even in the mood to try them. Go figure! However, the next day I sampled a link and was happily surprised. It actually tasted like bratwurst you could get in Germany! MISSION ACCOMPLISHED! With that said, it didn’t remind me of Weißwurst as much as it did the regular style of Bratwurst you would get at any local Imbiß. I froze a few pounds and will take them out to the Poconos to grill sometime in February.